My name is Don Moe and I reside in Jupiter, Florida. Since 1974 I have been an enthusiastic long-distance motorcycle rider. Here is a brief history of my motorcycling experience. Back in the fall of 1973 at the age of 27, I bought my first motorcycle, a used 1973 Kawasaki H1 with its 500cc, two-cycle, three-cylinder engine. I proceeded to ride it extensively over four months, putting nearly 8,000 miles on it. I discovered that I really enjoyed motorcycle riding, since it was in some ways similar to flying a private aircraft, which I had done for nine years and earning my Private Pilots license. However, I realized that the H1 bike was too small and had the incorrect engine for serious long-distance touring. After negotiating a trade-in with the Fort Pierce Kawasaki dealer in early 1974, I became the proud owner of 1974 Kawasaki Z-1, with its 903cc, four-cycle, four-cylinder engine. Although I didn’t buy it because it was the fastest street bike at that time, that fact and the very positive reviews convinced me that it would be a good, reliable motorcycle for my intended travels. I equipped it with a Vetter Windjammer-II fairing and saddlebags. Over the next two years, I travelled from Florida to Colorado on it twice, relocating there in 1975, and rode it extensively around Colorado during the five years I lived there. When I sold that motorcycle after six years to buy a newer model, it had nearly 56,000 miles on the odometer. By this time I was living in southern California. The next motorcycle was the 1981 Kawasaki 1015cc KZ1000 Shaft. This bike was nearly identical to my Z-1 with one important difference: Shaft drive instead of chain! I equipped it likewise with a Vetter Windjammer-III fairing and Krauser saddlebags. Over the period from 1981 to 1984, I rode this bike nearly 60,000 miles and travelled three times from southern California to British Columbia. Living in the Los Angeles area, my daily commute to work was quite long and riding the motorcycle to work saved significant time and fuel. I sold this bike in the spring of 1984 prior to my relocation to Germany. Upon arriving in Germany, I determined that owning a motorcycle was too expensive and the riding season much too short to justify buying another one there. During my ten-year sojourn in Germany, I therefore travelled around Europe by car, a 1984 VW Passat. In 1994 I returned to the US. Although I was now living in Florida again, I decided to refrain from motorcycling since I had promised my elderly mother that I would do my best to keep her in our own home and not to put her into a care facility. After many years, my mother passed away at the beginning of July 2010 in her own bedroom at the age of 98. 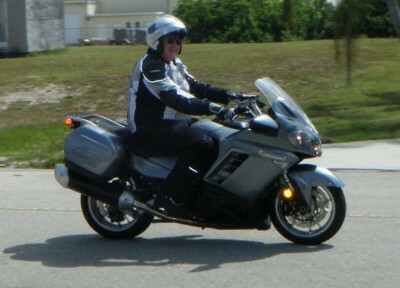 Now released from my obligation, within a few days I located a dealer in Stuart with a slightly used 2008 Kawasaki Concours 14 with only 3,352 miles on the odometer. I bought it in lieu of a newer model in order to discover whether enthusiasm for motorcycling was still part of me. Over the next six months I put nearly 4,400 miles on it and started learning more about the modern generation of motorcycles, even trying out a couple different brands. I also briefly owned a BMW R1150RT to determine whether the two-cylinder BMW model would feel right for me. After a couple months of alternatively riding the Concours or the RT, I decided that the Kawasaki was definitely the one for me, but the newer 2010 or 2011 model year would have such important improvements to be worth the extra cost. 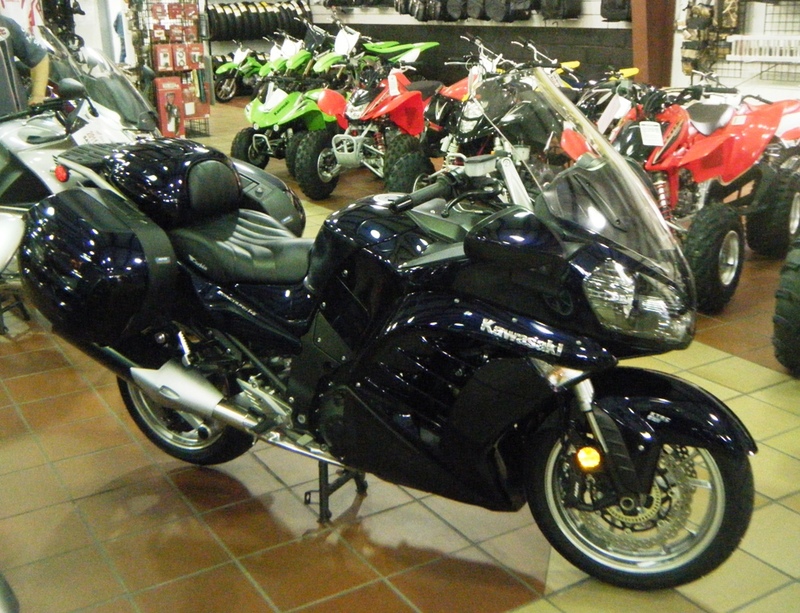 In January 2011, I happened to stop by the Stuart Kawasaki dealer on other business and found a very slightly used 2010 Kawasaki Concours 14 ABS motorcycle on the showroom floor, in dark blue, with only 1,447 miles on the odometer. After mulling it over for two days, I negotiated a trade-in of my 2008 for the used 2010 model. Over the next several months, I proceeded to outfit the bike with the necessary accessories for me to undertake a lengthy road trip comfortably, safely and easily across the United States during the summer of 2011. One additional important accessory, a SPOT Messenger GPS tracking device, permitted friends and family to follow my daily progress throughout my trip by visiting a special website that displayed my track on a map. Since the journey has concluded, the map now displays the entire journey in abbreviated form. 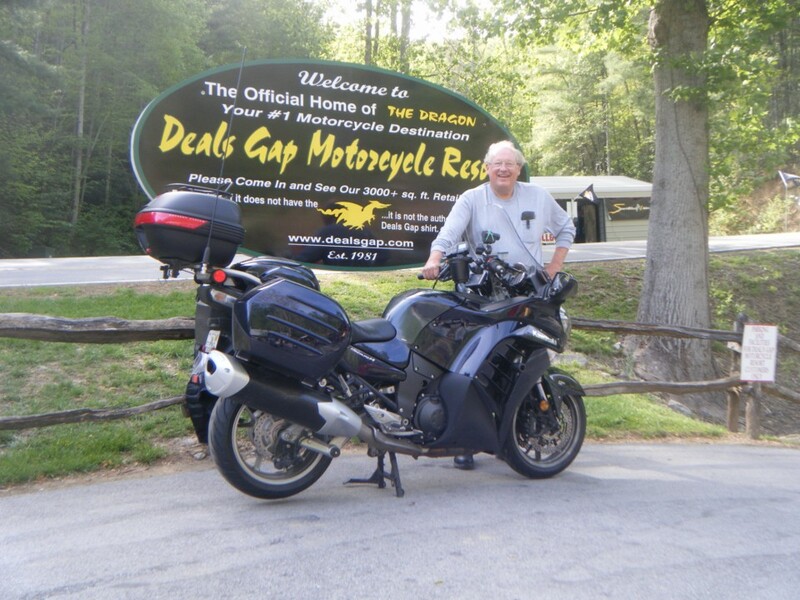 In the spring of 2011, I made two trips to the Appalachian Mountains area of Georgia, Tennessee and North Carolina and attended MSTA motorcycle rallies for owners of similar sport-touring motorcycles. These trips reinforced my confidence in the motorcycle as well as my riding abilities and stamina. On June 21st I finally embarked on my ambitious summer tour around the United States with visits along the way to several friends and family located in different states. During initial planning I anticipated that it could take about 70 days. After several weeks on the road with the trip going so well, I decided to extend the trip by nearly a month until the end of September. I had retired from computer programming before my mother passed on and was thus free of any obligations to an employer. Shortly after embarking on this journey, a friend suggested that I write about my travels and share my experiences. Liking that idea, I began to document my journey to a small group of friends and family. After a couple weeks I expanded that group to nearly 40 e-mail addresses to receive my travelogue updates. In nearly 60 messages I shared several of the numerous photos taken during my 100-day odyssey. While at the MSTA motorcycle rally in Johnson City, Tennessee in late June, the disk drive in my laptop computer suddenly died. Although I repaired the computer within a couple days, all of my e-mail and photos from the period between June 21st and 26th were lost. 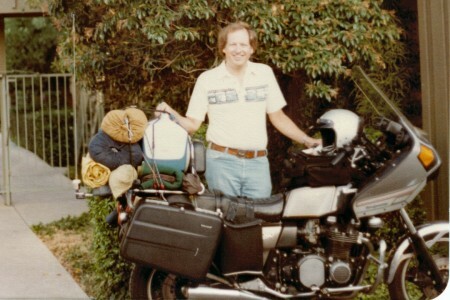 After returning home and completing my Summer Tour 2011 motorcycle journey around the country, I decided in early October 2011 to start this website in order to share my travelogue writings and photos more easily than by e-mail. On future trips I expect to post directly to this blog.